Miles Davis’ move into full-on fusion starts here. Abandoning his bebop roots and chasing electric dreams, rock-based rhythms, and ostinato pulses, the icon gives life to new music forms on Filles de Kilimanjaro, a titanic release prized for its historical significance and lasting beauty. Grounded and focused, the five compositions unfold like a unified suite. Such peak lyricism, flourishes, and phrases are experienced in the highest-possible fidelity on Mobile Fidelity’s 45RPM 2LP set. 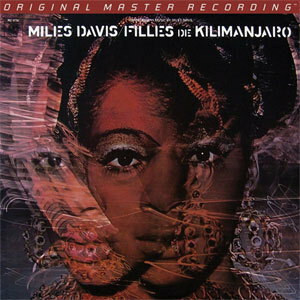 Mastered from the original master tapes and pressed on 180g vinyl at RTI, this collectable audiophile version of Filles de Kilimanjaro joins the ranks of eleven other essential Davis sets given supreme sonic and packaging treatment by Mobile Fidelity. Loaded with revealing signatures, the record takes on even greater import when heard the way Davis and his mates discerned it in the studio. Backgrounds are squid-ink black, pianissimo lines shimmer, and the electric piano emerges with tube-amp warmth. Chick Corea replaces Herbie Hancock and Dave Holland replaces Ron Carter on "Petits Machins (Little Stuff)" and "Mademoiselle Mabry (Miss Mabry)"